We take pride in providing excellent service, and to us, the feedback from our clients is of paramount importance. See for yourself what others are saying about SDOL. "The SDOL system is a tremendous asset to our teachers. The SDOL interface is very user friendly and easy to navigate. The grade book is by far the best grade book that I have ever used. The grade book is easy to set up and navigate for our teachers and administration. The system also flawlessly transfers grades to the Report Card and Parent and Student Portals and includes the ability to print progress reports. 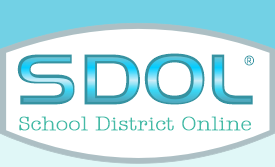 The SDOL Parent and Student Portal has increased communication amongst our parents and students through enabling them to log in and access current grades, assignment info, progress reports and report cards, schedules and attendance." “We have chosen to go with School District Online and have noticed a phenomenal change and a dramatic increase in communication with the parents and the home. E-mail has been a real boost to staff with Opt In and almost 100 percent of our families have an opt in account. This has allowed teachers to communicate with students, individual classes, or email out to everyone, the staff, or the entire parent population. It has also allowed us to keep track of how many emails are sent out each month, a drastic change for our web page and attendance. “It's about information management, making sure everyone knows how our children are doing in school, and what we can do to help them learn better. We have to always keep that at the bottom line. We strive to help the kids learn more productively and for the parents to understand the program as well as they can. Facilities Events, Maintenance & Technical Support features, etc. A great deal of thought has been put into the security and the ability to configure the overall look and feel of the interface. I believe “ease of use” is obtained by providing the user with only what they need and nothing more. SDOL has achieved this by providing multiple portals. Users are designated to specific security roles. The security roles are then coupled with various custom tool bar setups providing a specific look and feel for different types of users, i.e., teachers, students, parents and various administrative levels of district and school staff. SDOL provides us with ownership of our data. Its SQL administrative tools provide real time replication of the SDOL live data to most commonly used SQL back ends, including SQL Server, MySQL, PostgreSQL, Maria, and Oracle. This is a major enhancement over other SIS’s. Our needs make it essential that we have open source access to our own data. This allows us to choose a SQL backend we are experienced with and the continual development of custom applications using our own existing developmental framework. SDOL’s “Custom Jobs” feature also incorporates both replicated and custom created SQL tables. This allows us to write custom stored procedures for data mining and creation of data extracts in compliance to both internal and outside specifications. The extracts can be manually requested or automatically scheduled to transfer the data to other outside recipients and/or internally move extract files in various formats to any mapped drive location. I have personally participated in all of the California Dept of Education CALPADS User Advance Testing sessions and have worked closely with SDOL to ensure State Reporting compliancy. I experience the usual issues during the testing period but as result of SDOL’s effective and prompt support I've spent less time completing the process than my peers. The reporting process is complex enough without dealing with continued vendor software updates that may or may not prove to fix ongoing issues. The end result is we meet all of our State reporting deadlines and usually do so well ahead the other reporting districts. I am responsible for the overall management of our SIS and do not directly use the various Administrative, Teacher, Student or Parent portals on a day to day basis. However, I am responsible for successful training and continued support of how a diverse group of users interact with the SIS. As I manage these tasks I have found SDOL does an excellent job in providing the widest range of system features, flexibility and ease of use for managing our SIS responsibilities. I have too often been asked to implement various stand alone educational software products that can provide one or more of the above functionalities but not all of them. SDOL provides us with a single data system that can manage the most requirements. Bottom line, complex data issues require complex solutions that provide manageability and ease of use. SDOL has been providing us with just that."